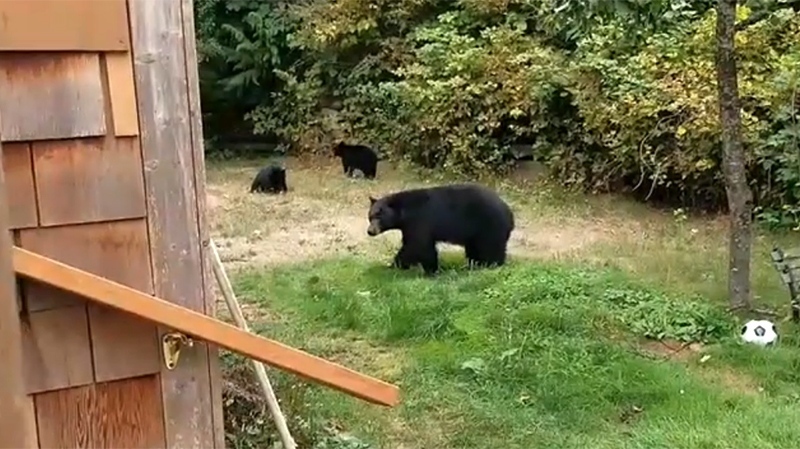 A British Columbia man asked a family of bears to leave his property in maybe the most Canadian way possible. When Jordan Cote heard his tenant’s dog barking outside on Monday, he walked out onto his deck to find a black bear with two young cubs just metres away. Cote took the dog inside and then returned to film the bears. “I need you guys to go,” Cote can be heard saying to the unwanted visitors in his video, followed by a “thank you” when the bears begin to turn around. Cote posted the video to a “Meanwhile in Sooke” Facebook group Thursday with the caption: “How a Canadian responds to wildlife.” Sooke is a community just west of Victoria, B.C. The video has more than 2,000 shares and 1,200 likes since it was uploaded on Thursday. Cote, who has lived on the rural property for two years, said he’s never seen bears in his yard before. He said he was shocked at how calm the mother remained. With a report from CTV Vancouver Island’s Jeff Lawrence. Man says he punched grizzly bear in the nose in B.C.